French doors have become a very popular addition to many homes. Unfortunately, many homes do not even use their french doors. They have become more of an ornament rather than a functional door. Well, at Bravo, we have a great solution to this problem - a motorized retractable French door screen. 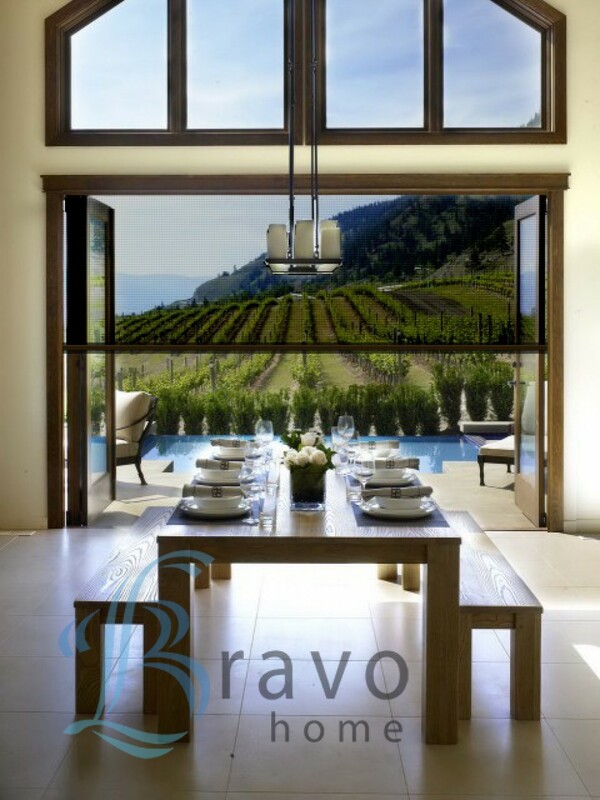 Bravo custom motorized screens allow you to open your doors and windows to allow the fresh air to come in. They allow a natural air circulation without allow annoying bugs, insects, dusts and debris in. Truly, retractable door screens allow you to enjoy your home and up it up to the outdoors without any of the drawbacks. The frame of Bravo screens are fabricated from a durable aluminum castings that give you a sturdy, long-lasting screen. The frame and casing are available in a complement of colors that will blend seamlessly into your surroundings. Bravo retractable screens also contain the top of line mesh fabrics that appears almost invisible and do not distract from your views. In addition, the mesh fabric provide great protection against UV rays that damage and discolor hardwood floors, furniture and carpeting. Also Bravo retractable door screens help reduce heat transfer, thus keeping your home and living areas cooler and more comfortable. Finally, our retractable screens cut the sun's glare and give you a more enjoyable experience in your living space. A great option is to have your retractable French door screen with all its benefits to be motorized. Yes, with just one press of a button, you can control your retractable screens. At Bravo, we manufacturer the most streamlined, compact, discreet motorized system that your French door screen to open or close with ease. * Screen housing is 0.9" x 2.5" in diameter. * Can be mounted on any style of French doors - in wing or out swing, tilt & turn or glide doors.